The advertising slogan didn't turn out to be 100% correct. 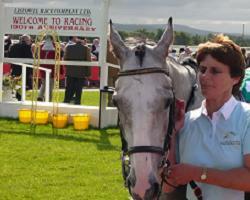 Although the Listowel Festival became a seven day dual code event in 2002 the 150th anniversary was hit by rain and had to be reduced to five days' national hunt racing. As it turned out we got lucky as our chosen bite of the festivities was three days' racing commencing Tuesday, which would have been day three but was now day one. Looking back to my report on our last visit here – way back in 1996 – I note that we paid £74 return for each Stansted Ryanair flight to Cork. This time Adrian and I flew from Manchester to Kerry with Aer Arann for similar prices. A more relevant price comparison is the fare paid by the third member of our party – Richard – who flew from Stansted to Kerry with Ryanair for £25 return! So twelve years on and the flight cost was a third of what it used to be. It's no wonder there's no oil left. Kerry Airport (a shed) is conveniently situated for both Listowel and Tralee. We stayed in Tralee for two reasons. Firstly it's a bigger place so there's more going on and secondly it's difficult to find accommodation in Listowel during the festival. Ade and I had rooms at the excellent “Willows” B&B run by Tim and Mary Walsh, a short walk from the town centre. The breakfasts here were brilliant. You could choose your eats the night before from a menu of seven or eight dishes. The full Irish included white and black puddings (big in these parts). Smoked salmon and many other delights were on offer. Listowel is the thick end of half an hour's drive from Tralee. So we set off on Tuesday morning to tackle the seven race card. There were five hurdle races and a couple of bumpers. The latter has proved a good medium for us over the years. 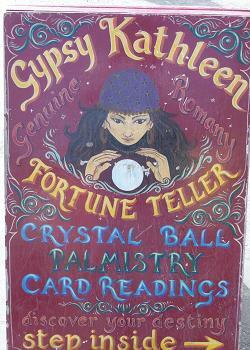 We considered a consultation with Gypsy Kathleen – genuine Romany fortune teller – but in the end decided to rely on our tried and tested systematic approach! The track is all one enclosure, 20 Euro per day entry - £16. Not a bad price – it costs me more than that to go to my local track in Ludlow. It didn't take long to back a winner as we were on Alpha Ridge in the second. A game 6/1 chance which paid – in the end – a disappointing 7.60 on the tote. The ever popular Ruby Walsh won two of the next three races at poor tote odds so obviously we were not on. From the crowd noise it appeared nearly everyone else was. Gypsy Kathleen – sure to have had all the answers. Two eighteen runner bumpers followed and I got heavily involved in the first of these backing four horses all at huge prices. This included the reserve Onzo Mor and the McManus owned Clogner Lass. As they approached the final furlong the latter two and Financial Regulator (the paper favourite) were neck and neck. The three horses crossed the line together and my initial thought was that the fancied one had got up. The SIS camera man seemed to agree as he focused on Financial Regulator as it was being led towards the winner's enclosure. Then the Tannoy result came – “First no. 15 Clogner Lass”. The S.P. was 12/1 but we were on the tote, of course, which paid 25.20! Distances; two short heads. Juice! 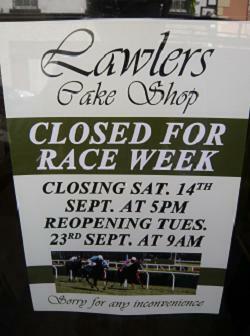 They take racing seriously in Listowel! So a winning first day and dinner to follow at the Oyster Tavern on the Fenit Road. Good but considerably dearer than our last visit here in 2004. Main courses cost between 25 and 32 Euro. 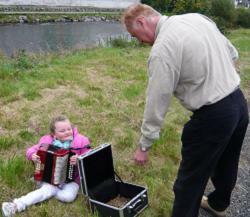 Back into Tralee after dinner for some excellent music at Sean Og's and Bailey's. Both pubs are strongly recommended for the quality of Guinness and the live music they have to offer. Wednesday's card featured the Guinness Kerry National among the eight races. 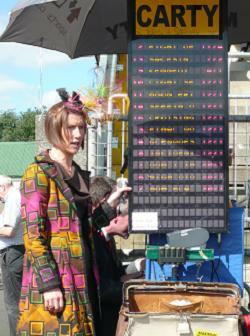 Colourful Mary Carty was shouting the odds on the first:“ 9/4 the fiold... 11/4 baaah!” A silent sober suited bookmaker standing next to her was 5/2 the field 3 bar but doing less trade than Mary. It was much more crowded than the opening day, much warmer too. Once again we got off to a winning start with a microscopic bet on Glenquest in the first; 14/1 S.P. but the tote paid us 24.10. However it was down hill from there with seven losing races. Even Pricewise couldn't get near the winner of the big one as last year's winner Ponmeoath triumphed again. We considered Fantouche the value bet of the day in the Beginners Chase. Walsh and Carberry were on opposing fancied runners and although neither jockey won the race our selection was foiled by 8/1 shot Just Naturally on the run-in. A losing day. Oh well, a special treat for dinner to cheer us up – Nick's Restaurant and Piano Bar down in Killorglin. Wonderful lightly fried calamari to start followed by monk fish served with a chick pea concoction and an interesting risotto. Brilliant. Seven races on Thursday but the first two were hopeless from our perspective with just three and five runners respectively. So the betting possibilities were reduced to five contests; three handicap hurdles, a beginners' chase and the last race bumper. We went close in our first three races with decent priced seconds: Clan Music 4/1, Arkendale 7/ 1 and Sanglote 14/1 all potentially bigger prices on the tote. But potentially is no good so it was all down to the lucky last and two carefully chosen and heavily backed selections in the bumper. Miltown Boy which tried to make all and débutante Dando's Express. I was with Adrian up in the stands and as they came into the straight he yelled in my ear, “ Here comes our pig on the outside!” Sure enough Dando took it up 100 yards out and held on to win by a neck! Returned 8/1 with the tote paying us a bit more thanks to an 11.90 dividend. Two winning days out of three can't be bad. We spent our last evening in Tralee. Dinner was at the Cooperage restaurant in Castle Street. This was a good find, an early bird (sit down by 7.30pm) three course multi choice menu with tea/coffee for just 23 Euro. There's a branch in Killarney too. Recommended. 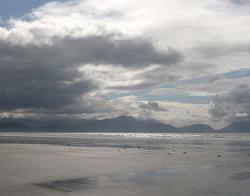 On Friday, before heading back to the Kerry shed, we took a trip out to Inch Beach. The purest air on the planet. Another great trip, some good priced winners topped up with some truly wonderful eats.